All your stuff is about to be so, so, *SO* organized. The products in this post were updated in August 2018. 1. 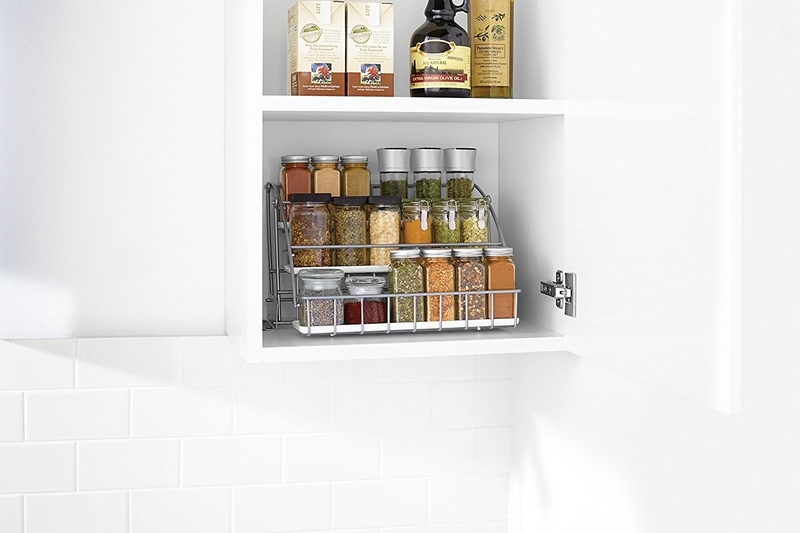 Make your spices easier to reach with a pull-down rack. 2. Always have toilet paper on hand with a mountable holder that'll help prevent you from having to sheepishly ask a passerby for a roll. 3. 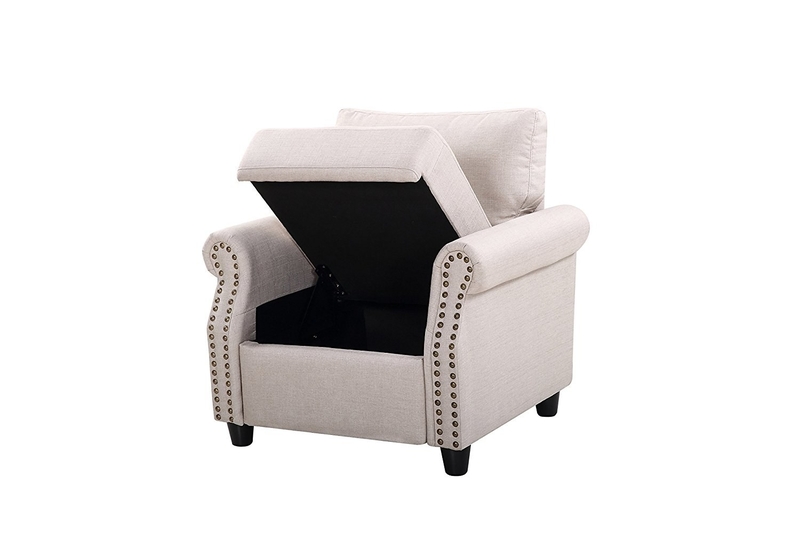 Invest in a linen armchair that opens up to reveal some pretty ample storage space. Get it from Amazon for $149.99. Available in two colors. 4. Keep your bathtub clutter-free with a mesh shower curtain caddy with six roomy pockets that'll hold everything. 5. Get use out of every corner in your house with a wooden shelf designed to fit perfectly. 6. Use a stainless-steel toilet paper holder with a built-in shelf to prevent accidental cell phone drownings. Get it from Amazon for $24.99. Available in three colors. 7. Create the additional space you desperately need in your closet with an adjustable six-shelf closet system. 8. Try a tabletop hair tool stand to store your curling iron when it's still too hot to put away. 9. Try a kitchen table with stools that double as additional storage. Get it from Amazon for $331.98. 10. Try easily removable inserts in your drawer to give everything its place. Get a set of four from Amazon for $13.87. Available in two colors. 11. Organize all the plugs in your garage or home with a hub that separates them while they're plugged in. Promising Review: "This item cleaned up an unsightly mess on our bathroom vanity and even allowed a place to put a countertop towel rack that wasn't tall enough. It freed up space in the outlet too. It's just a box with some holes in it, but it looks very nice and keeps our new home looking neat." —Pat f.
12. Mount a toothbrush holder with tons of storage space on your bathroom wall for help keeping your counters clutter-free. 13. Hang an over-the-door shoe rack capable of fitting 36 pairs of your precious footwear so you can finally get them off your closet floor. Get it from Amazon for $19.90. Available in three sizes. 14. Use a black leather remote control organizer so you're never stuck searching through your sofa cushions again. 15. Create a designated area to press your clothes with an ironing board/hamper unit. Get it from Amazon for $44.99+. 16. Utilize even the smallest spaces with slide-out storage shelves. Get it from Amazon for $24.99 or from Walmart for $24.95. 17. 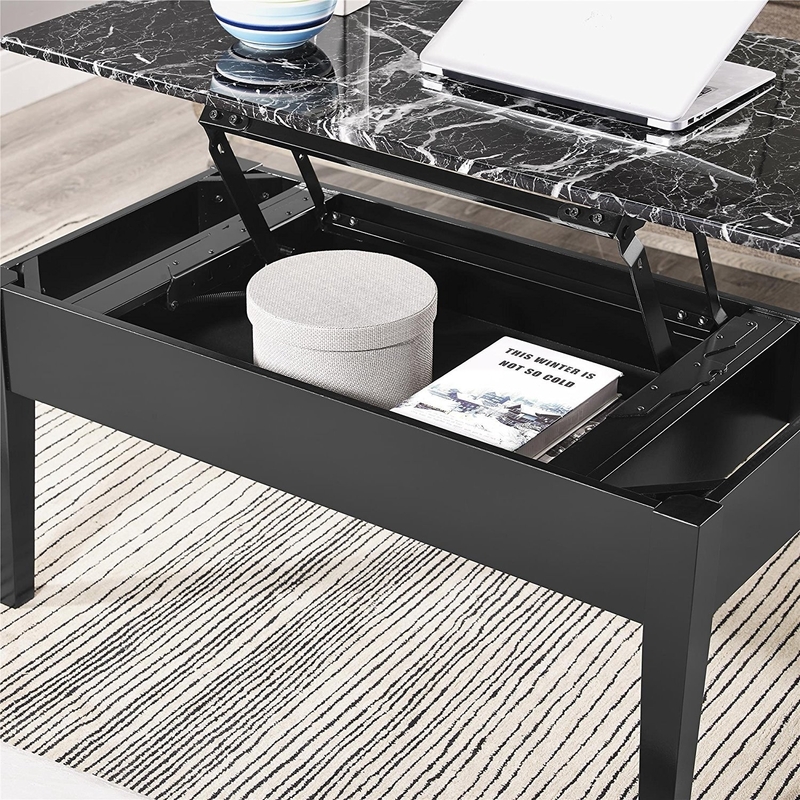 Upgrade your living room with a faux-marble coffee table that'll also serve as some additional storage. Get it from Amazon for $111.69. Available in two colors. 18. Organize under your sink with a chrome hair tools holder that'll fit your blow dryer, curling iron, and straightener. Get it from Amazon for $12.99. Available in two colors. 19. 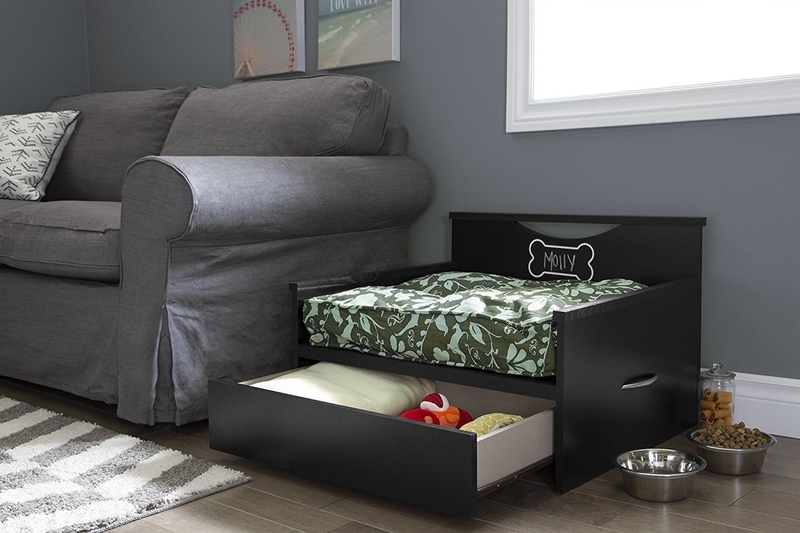 Let your pet lie in luxury while also having a discreet place to store all their toys with a two-in-one bed. Get it from Amazon for $226.84. 20. Keep your favorite beauty products neat and transportable with acrylic organizers that adhere to nearly any surface using adhesive velcro. 21. Make your plug into a shelf so your devices have a place to sit while they charge. 22. Keep your paper towels handy while adding a little bit more storage space with a magnetic holder. 23. Have a neat and organized tea collection with this storage container that'll perfectly hold up to 100 bags. 24. Get a hanger designed specifically to hold your favorite camis and tanks that are typically kinda hard to store. 25. Store even your heaviest pans with a sturdy freestanding rack. Promising Review: "I have a small cast iron collection and wanted a way to store it. I was wary if this would hold the weight. Currently, I have 12 skillets on my rack and don't see any noticeable sagging. I would not hesitate to buy another one of these. If you are on the fence about buying this one, don't be! It is a great product and handles the weight well." —Michael C.
26. Let bath time be fun *and* organized with mesh pockets that suction to your shower wall. Get it from Amazon for $8.23. Available in four sizes. 27. Give your pots a way to lie low and install a pull-out base organizer. Get it from Amazon for $59.63+. Available in two sizes. 28. Store all those plush toys and create additional seating with a storage beanbag chair. 29. Give your makeup a beautiful place to stay with an acrylic storage box. It also makes everything visible, so you're not digging for your favorite products. 30. Keep your sponges and dish brushes moisture-free with a flexible plastic sink caddy. Get it from Amazon for $19.98. Available in seven sizes. 32. Keep your cabinets clutter-free with a six-piece organizer set. Get the six-piece set from Amazon for $25.83. 33. Pets need storage too! Try a canvas bin for your BFF's toys so they're easily accessible (for them) and easily cleaned up (for you). Get it from Amazon for $14.99. Available in 11 styles and two sizes. 34. 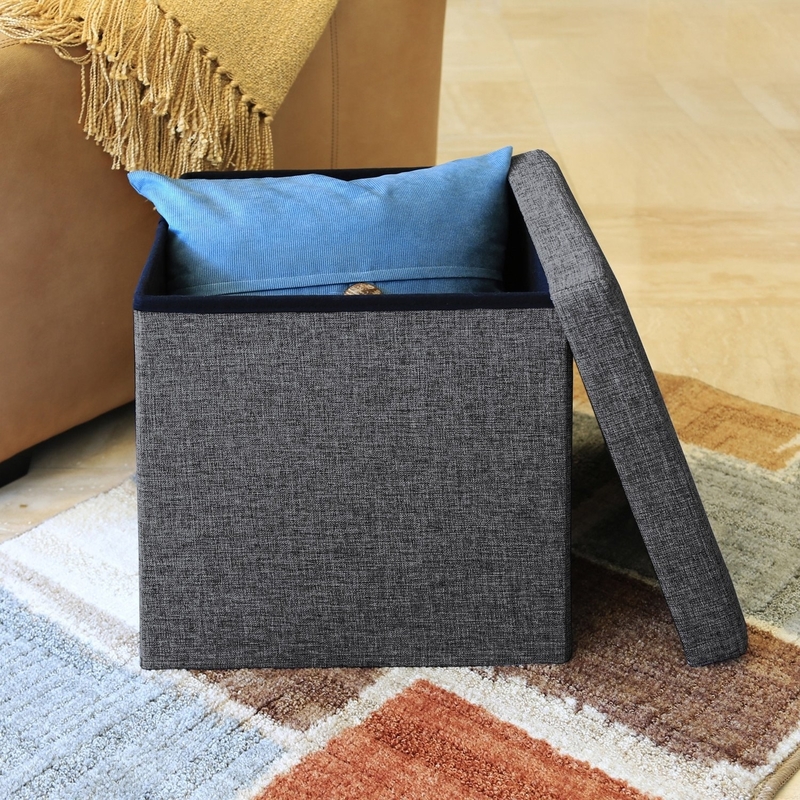 Create additional storage in a snap with foldable storage ottomans. Get it from Amazon for $19.99+. Available in seven colors and two sizes. 35. 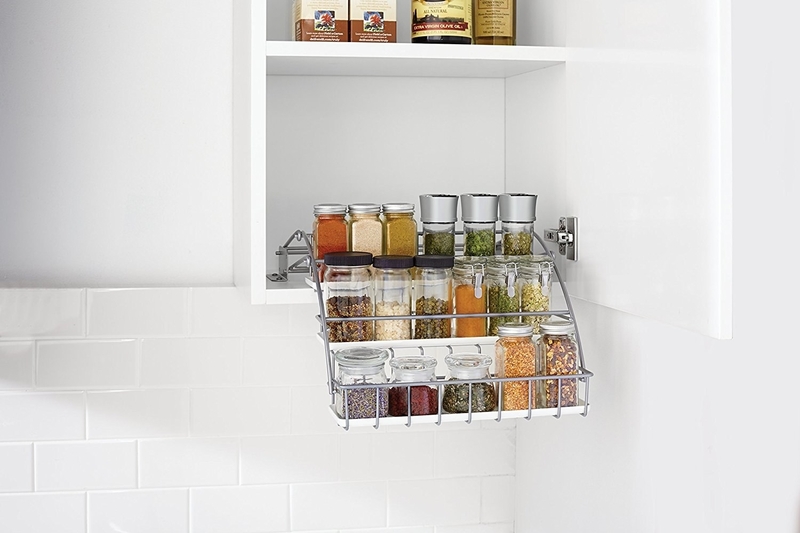 Make your dishes easier to grab with a three-tier chrome kitchen rack that stands them up and organizes them for you. Get it from Amazon for $25.99+. Available in two sizes. 36. Turn your pantry into an Instagram-worthy organized dream with clear plastic storage bins. Get it from Amazon for $19.99. Available in three sizes. 37. Or try a hanging pantry organizer that easily rests over the top of your pantry door for easy access to your favorite snacks. 38. Organize all your ties and belts with a rotating rack that fits right onto your closet rod. 39. Splurge on a six-piece refrigerator and freezer bin set that'll help you get the most space out of your fridge. Get it from Amazon for $37.06. 40. Upgrade your bed frame to one with ample under-bed storage, like this tufted headboard. Get it from Amazon for $399.99+. Available in two colors and two sizes. 41. Get an organizer to give all your mops, brooms, and rakes a place to sit neatly. 42. Organize all your Nespresso pods with a glass-top drawer that'll let you see what you have without losing any counter space. Promising Review: "A real space saver that suits my needs perfectly. I live in a studio with limited counter space, so this allows me to have capsules at hand. In addition, the top is the perfect size to fit my Nespresso Pixie, Aeroccino 4, latte cup, and small measuring cup. They're all at the ready to make a quick latte at a moment's notice." —Juanita W.
Get it from Amazon for $19.87+. 43. Get an organizer for all those boxes of foil, wax paper, and plastic wrap that are always jamming up your drawers. 44. Finally, have a place for all those large flat cooking tools with a steel basket you can hang inside your cabinet.